Sam Rainsy Party Sen. Hong Sok Hour is escorted from the supreme court back to Prey Sar Prison where he is being detained, June 22 , 2016. Exiled Cambodia National Rescue Party (CNRP) leader Sam Rainsy rallied to the defense of an opposition lawmaker sentenced to a seven-year prison term on Monday for posting a disputed copy of the border agreement between Cambodia and Vietnam on Facebook in 2015. On Monday the Phnom Penh Municipal Court found Senator Hong Sok Hour guilty of forging and publishing public documents, and of incitement to cause instability, when he posted a disputed copy of a 1979 Cambodia-Vietnam treaty on Facebook that said the two countries had agreed to dissolve their mutual border. 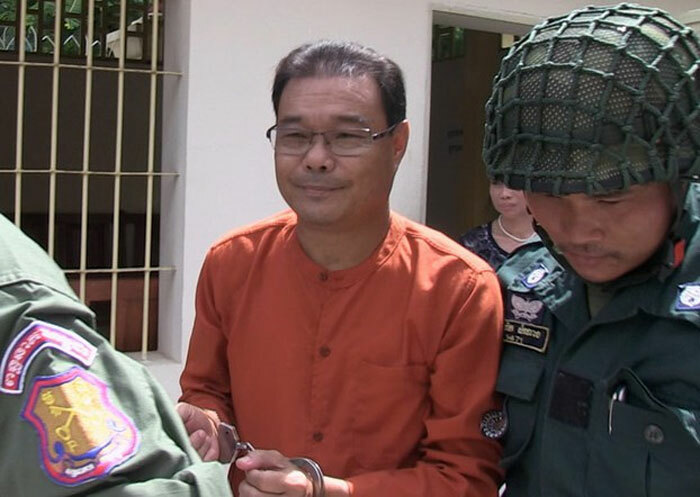 Hong Sok Hour and his legal team refused to show up at the court on Monday. One of his attorneys, Meng Sopheary, told RFA’s Khmer Service Hong Sok Hour and his legal team boycotted the proceedings because they are unjust, as the team was prevented from presenting evidence that showed the lawmaker was innocent. Phnom Penh Municipal Court judge Ros Piseth said the court found moot Hong Sok Hour’s requests to summon experts on border issues. It’s unclear if Hong Sok Hour will pursue an appeal. “We will certainly be guided by his excellency Hong Sok Hour as to whether he will file an appeal against the court verdict,” Meng Sopheary told RFA. Senior CNRP lawmaker Son Chhay was unsurprised by the court’s decision, saying the courts are a tool used by Hun Sen and the CPP to undermine the opposition. In an open letter published by Sam Rainsy on Monday, the CNRP president accused Prime Minister Hun Sen of using the courts to punish an opponent and “pervert” the election process. “Seven months before the June 2017 commune election this verdict is another act of political repression in order for Hun Sen's CPP (Cambodian People’s Party) to pervert the election process by creating and maintaining an atmosphere of fear and intimidation,” Sam Rainsy wrote in the letter. Cambodia’s local elections are set for 2017 and the national elections are scheduled for 2018. In the disputed 2013 elections, the CPP lost 22 seats in its worst showing since 1998. Sam Rainsy blamed the court for failing to do its due diligence. “Appropriate technical research – that the Cambodian tribunal could easily do by itself – leads to at least one Internet site showing that the incriminating document posted by Senator Hong Sok Hour on 11 August 2015 and deleted two days later, had been circulating on the Web long before its posting by Hong Sok Hour and it originated from a source totally independent from Hong Sok Hour, who is therefore unfairly accused of forgery,” Sam Rainsy wrote. Hun Sen was appointed prime minister during that period when Hanoi had control over Cambodia. Since then questions have been raised about Hun Sen’s relationship with Vietnam, and the political opposition has attempted to use the Cambodian people’s distrust to their advantage. In October Hun Sen ordered police, immigration and aviation authorities to "use all ways and means" to prevent Sam Rainsy from returning from what was a self-imposed exile. He has pledged to return to the country before the elections. While the court was sentencing Hong Sok Hour, about 20 land activists representing Borei Keila and Phnom Badh communities launched their 27th Week of protests under the Black Monday Campaign in Phnom Penh. “How is it possible for ordinary people like us to stage a so-called color revolution when we are financially stranded, unarmed and we don’t have the armed forces to back us up,” she told RFA. Hun Sen has suggested that his political opponents are seeking a “color revolution,” a reference to pro-democracy movements that sprung up in Ukraine, Georgia and other countries where protesters rallied under colored banners. Civil society groups and their supporters began staging “Black Monday” protests soon after officials from the human rights group ADHOC were arrested in connection with the government’s wide-ranging probe into an alleged affair between CNRP leader Kem Sokha and a young hair dresser. In addition to the ADHOC arrests, the Cambodian authorities also arrested an election official. At the same time a U.N. official was also charged. While Black Monday began as an attempt to pressure the government over the arrests, it has morphed into a more generalized campaign against government abuses, including land confiscations and demands for a thorough investigation into the murder of government critic Kem Ley in July. Sar Sorn dismissed Hun Sen’s characterization of the movement and vowed to continue. Reported by Sel San and Heng Sun for RFA's Khmer Service. Translated by Nareth Muong. Written in English by Brooks Boliek.